Did you know that some liquids mix and some do not? 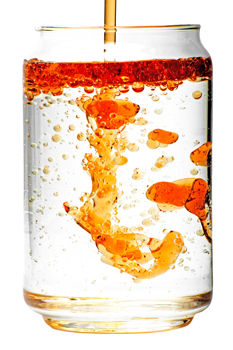 This is a very cool way to learn about density! The great thing about this experiment is that you can mix the liquids in any order, but to begin with, this is our suggestion. Fill the glass about half way with regular water. Add a drop of food coloring, if you have some handy. Be careful not to add too much or you might not be able to see what is taking place. Slowly pour some of the syrup into the water and observe what happens. Does it sink or float? Slowly add some of the oil. It is a good idea to hold the spoon just above the water level, touching the side of the glass, then slowly pour the oil onto the spoon. Does the oil sink or float? Each of these liquids have different densities (the amount of molecules per square inch). The denser liquids have more molecules, this causes them to sink to the bottom. The less dense liquids float. What happens if you add the food coloring last? What happens if you switch the order or liquids? What happens if you do this in a closed container (water bottle), put the lid on and shake it up? It looks like you have some serious experimenting to do!